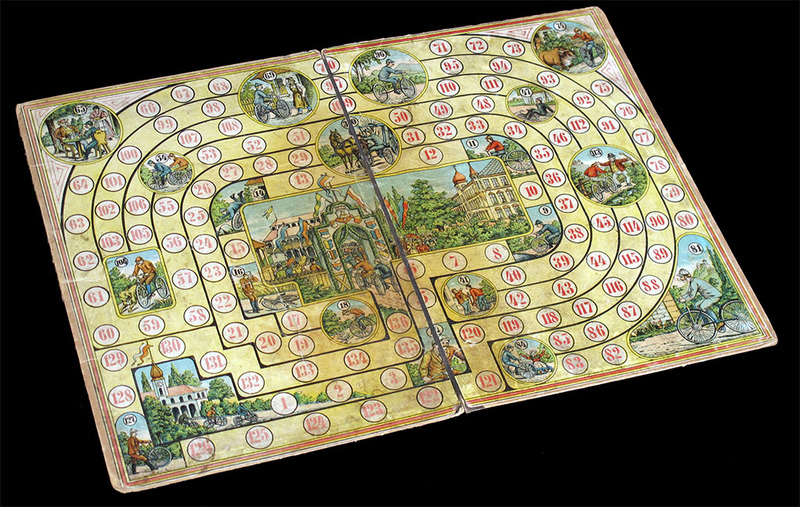 Two-fold German board, measuring 53 x 38 cms. 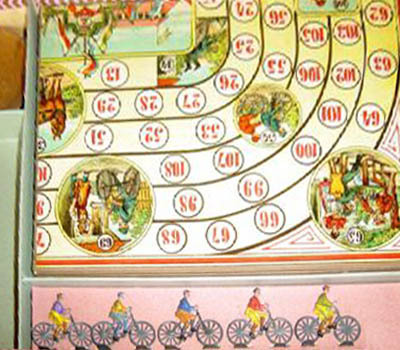 There is at least another version of the game (see below) in which the board is four-fold. 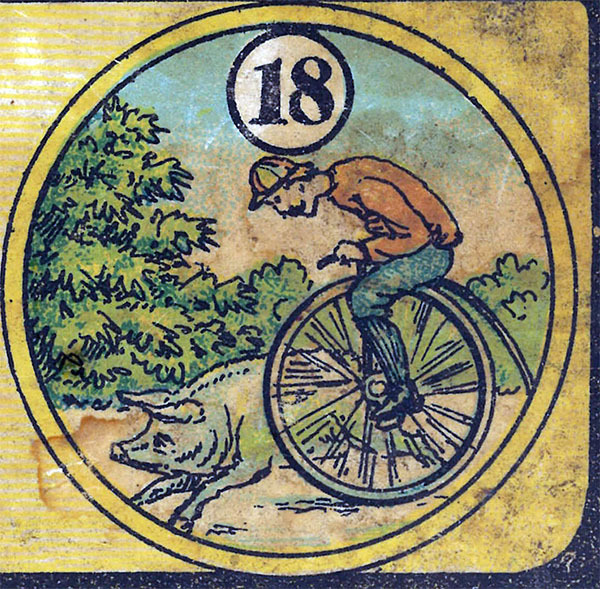 This game is an interesting example of how the high wheel bicycles (aka Ordinaries, Bone Shakers or Penny-Farthings) were replaced by modern bicicles. 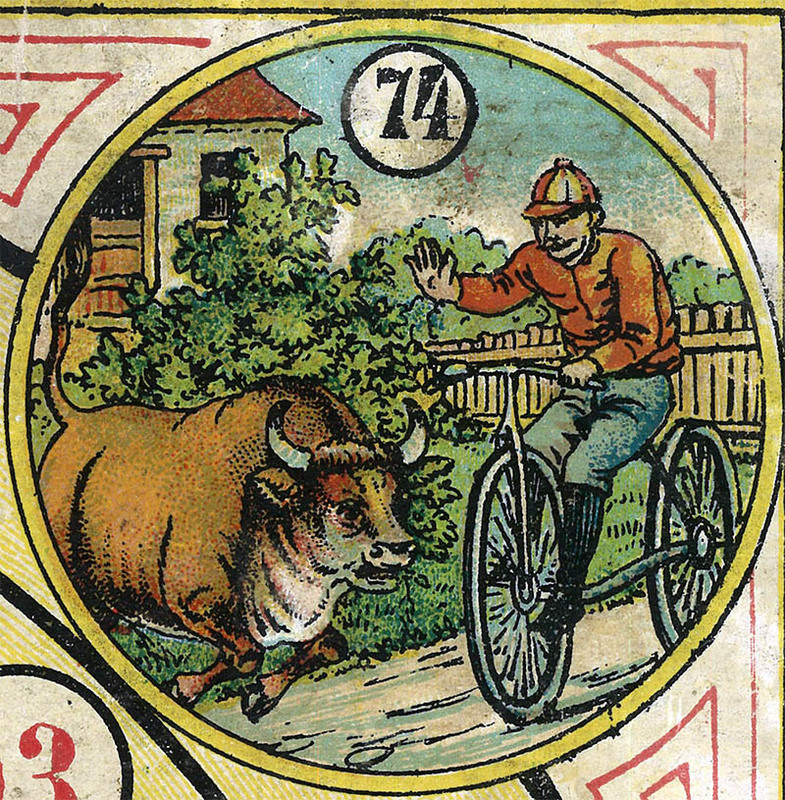 As I said in my comment to this other game, this happened around 1890. 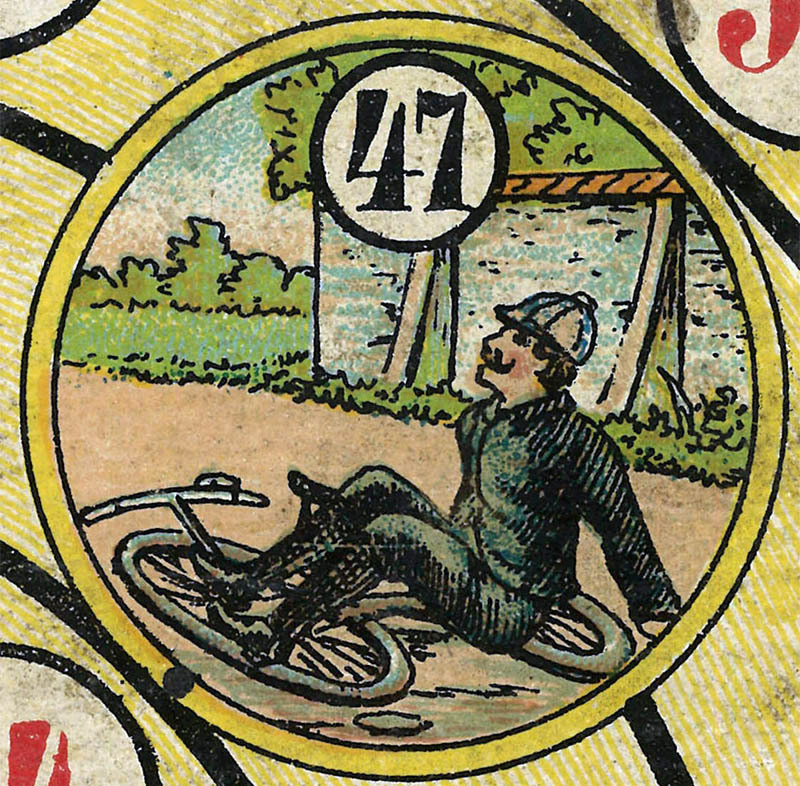 In this game we find a variety of front-wheel-drive bicycles which look quite primitive. 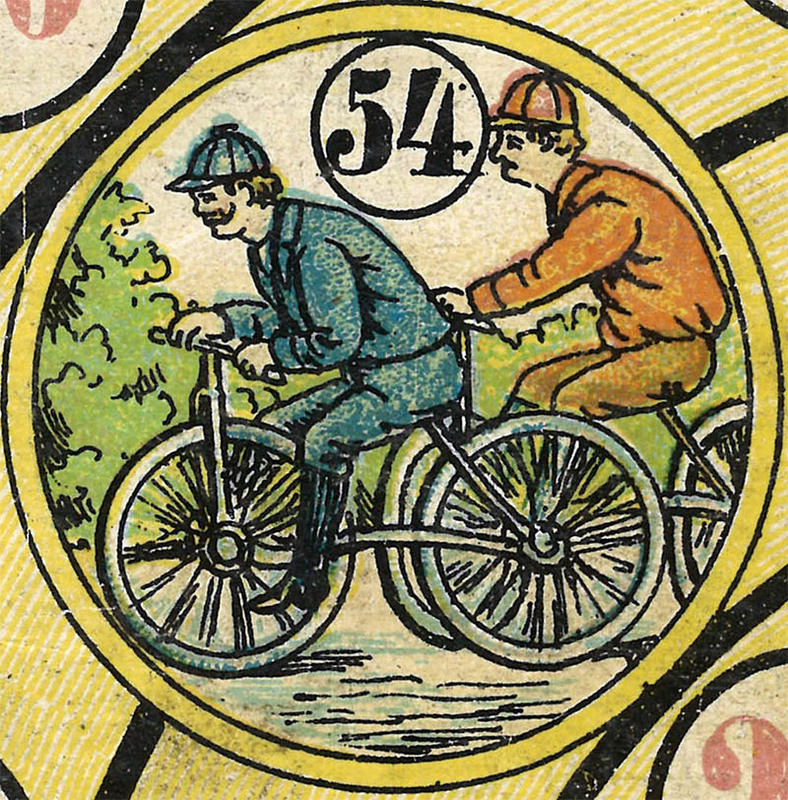 In some cases I wonder if the artist depicts the bicycle correctly. 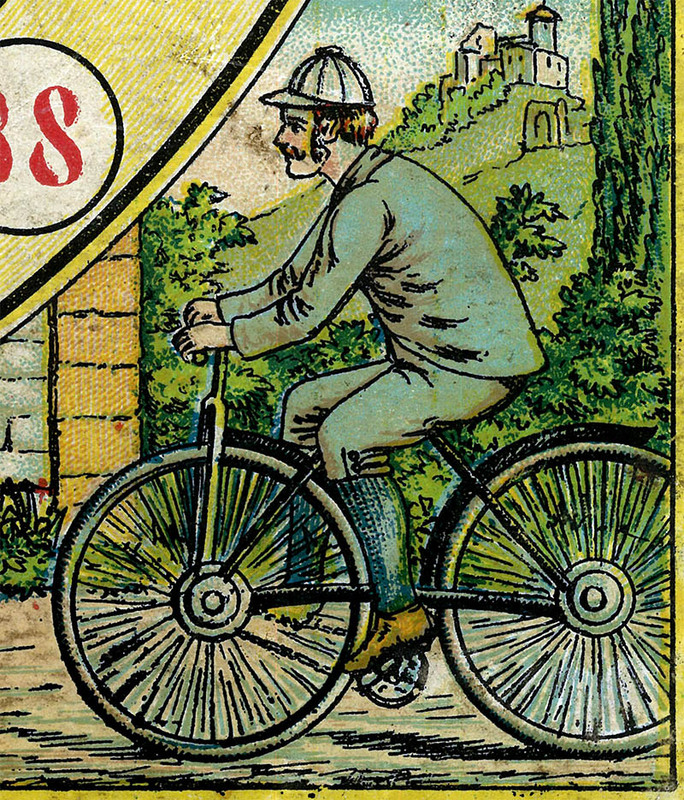 Check the bicycle above, in which we clearly see a chain to the front wheel. 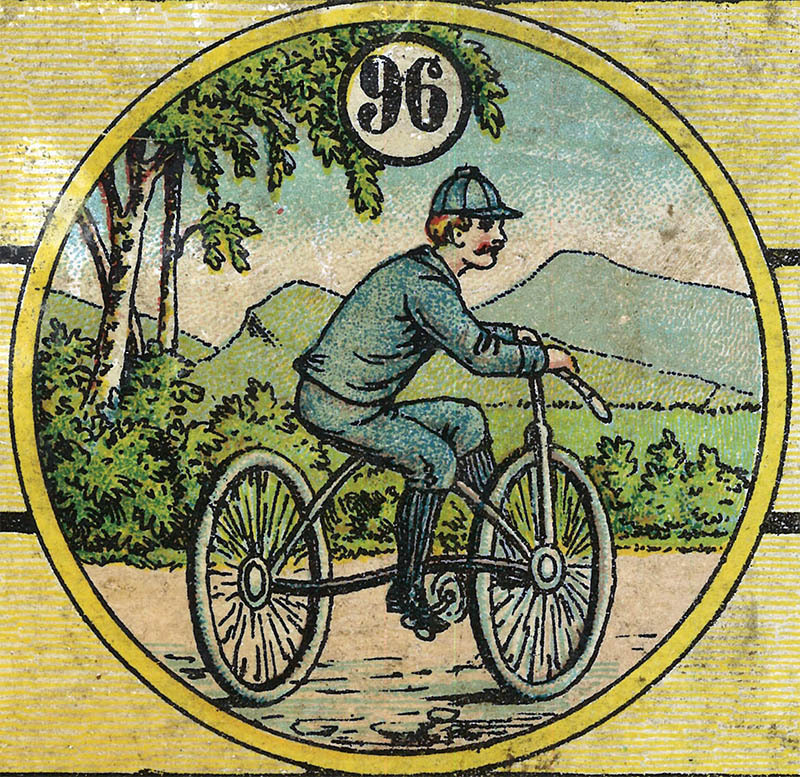 Since the invention of the safety bike not many bicycles have used the front-wheel drive. 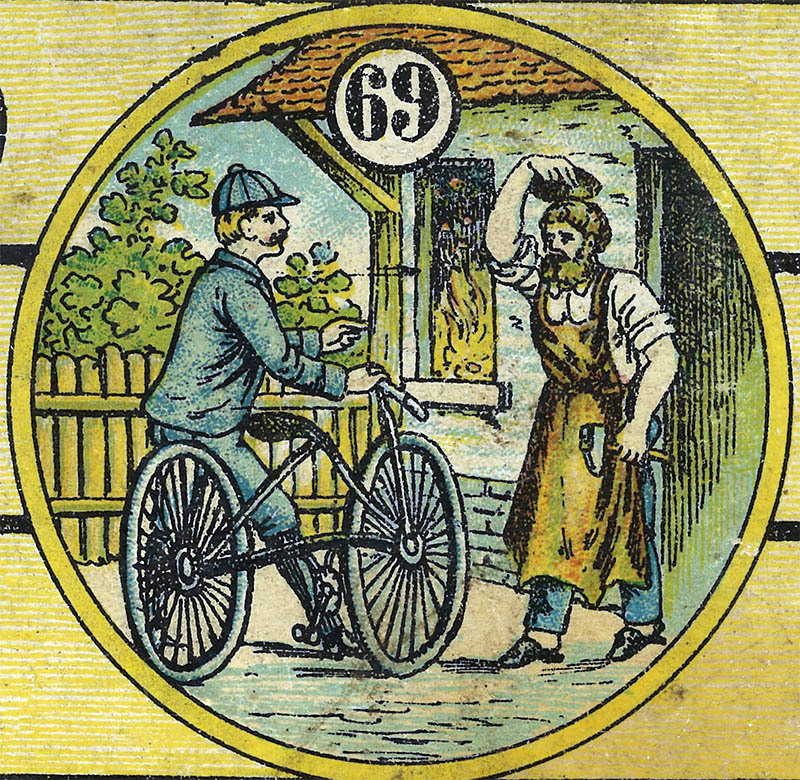 However, I quote from the Wikipedia: "By 1885, the safety bicycles cataloged in Henry Sturmey's Indispensable Handbook to the Safety Bicycle included seven with lever front-drives, 44 with geared front-drives, and only nine with chain rear-drives." On the other hand, here is a front-wheel drive bicycle without chain. Unless it is geared somehow, the pedals move the wheel in a gear ratio of 1:1, as in a high wheeler, but without the advantages of the big wheel. You cannot go very far with that. Is this a chain to the front wheel again, or is it a lever front drive? This one never needed a chain. Taking the bike to the repair shop. Is this a lever front-drive bike? 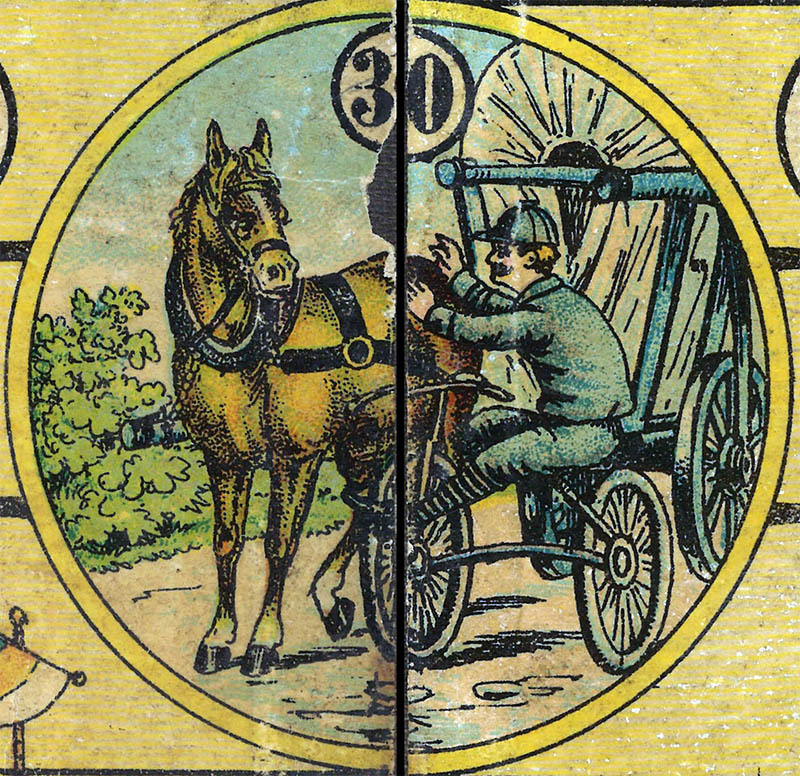 Here is the final square of this game. Of course it is a game of goose, arriving to a final garden/paradise square, in this case a turn-of-the-century palace, but I do not have the specific rules for it. 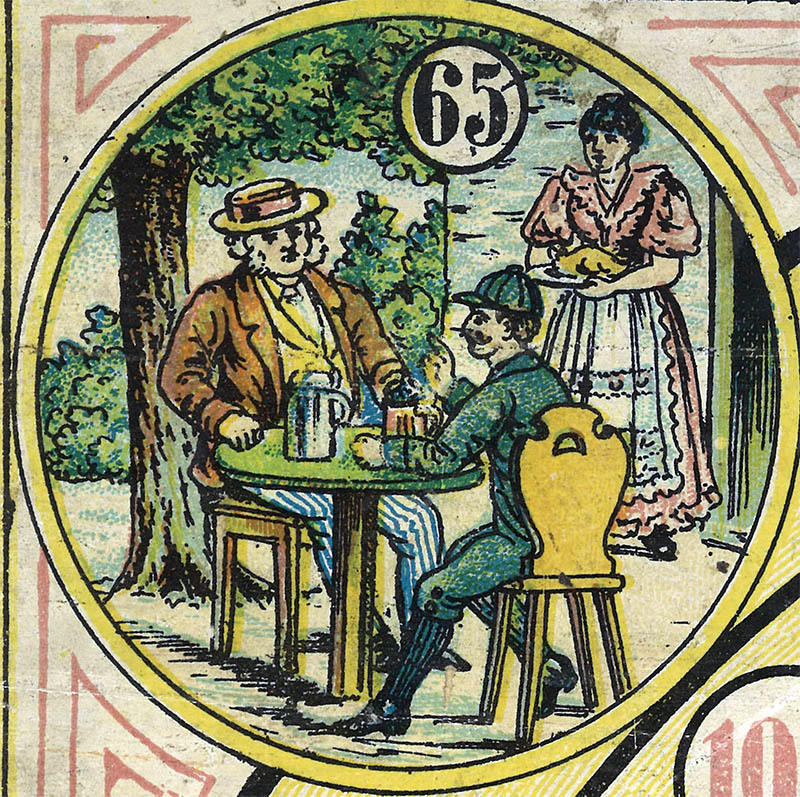 (c) the name of the game is in three languages, although the French is in smaller black characters (and almost unreadable), and apparently there is no maker's name, but of course that is hard to tell from these pictures. 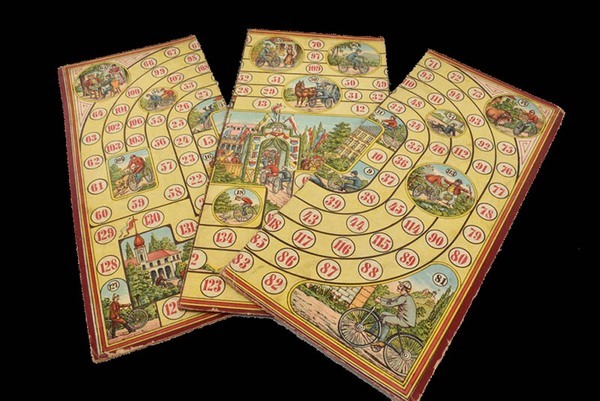 It is also interesting to notice that the board contained in this box is four-fold while the one I have is two-fold. 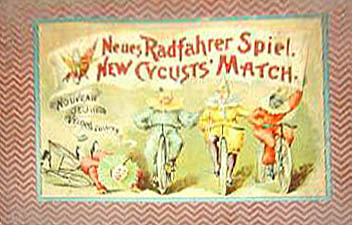 This means that there were at least two versions of the game. 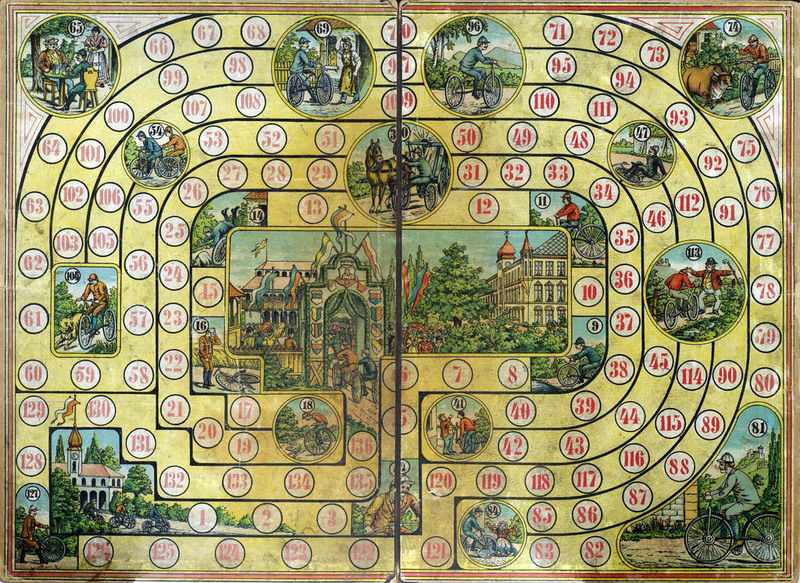 There is also a threefold version of the board. As far as I know this one was included in a combination box along with other games. Thanks to Laisvydas for finding this game.